The cosmetology industry has grown in leaps and bounds over the last few decades. The pampering that was once reserved for the elite, has become commonplace for the every day man and woman. Consequently the demand for cosmetologists has opened up career opportunities for men and women across the country. From hair cuts to pedicures; facials to manicures, graduates of cosmetology schools learn how to pamper their clients and give them a sense of well-earned luxury. A career in cosmetology is not for everyone. It requires drive, determination and a great degree of self-motivation. But for those students with the necessary passion, a career in cosmetology can offer both professional and financial independence. At first glance, cosmetology students may think that there are few, if any, scholarship programs devoted to helping them achieve their educational and professional goals. Liberal arts scholarships, and scholarships for students pursuing degrees in science and mathematics continue to get the lion’s share of attention. But recently, there has been a nationwide drive to promote vocational programs that prepare students to enter the workforce with the marketable skills they will need to succeed in their chosen careers. This has led to many scholarship programs exclusively devoted to the financial demands of cosmetology students. Whether you are training at a community college, beauty school or vocational school, there may be a scholarship to fit your needs. Cosmetology scholarships are available from a number of different sources, including businesses, corporations and professional associations. Many scholarships are supported directly through beauty schools, colleges and vocational schools. For students moving into the heady world of cosmetology, the opportunities for financial aid have rarely looked better. Many businesses and corporations associated with the beauty industry provide scholarship opportunities to cosmetology students struggling to meet their tuition costs. These scholarships may be based on merit or need, and may include restrictions concerning the student’s school of attendance. As with all scholarship programs, the first key to receiving any award is to apply early. These are career specific scholarships, and as such there will be a limited number of awards and large number of applicants. The following is a sampling of cosmetology scholarships supported by corporations and businesses closely linked to the beauty and lifestyle industry. The Alice Madden Barton Scholarship Program is sponsored Great Clips, the national salon chain. Scholarship awards are available to all high school graduates who are interested in pursuing cosmetology or barbering as a career. Awards are given twice annually, in January and and July. The Joe Francis Haircare Scholarship Foundation was founded by one of the premier entrepreneurs in the haircare industry. The foundation provides $1000 scholarships to eligible students applying to, or enrolled in, a barbering or cosmetology school. More than 20 scholarships are awarded annually. The PBA/NCA Sally Beauty Scholarship is sponsored by the Sally Beauty Store chain. Seven $1000 scholarships are awarded annually to high school graduates pursuing a career in cosmetology. A further six $500 scholarships are available to industry professionals who are returning to school for further training. Professional associations and organizations often provide valuable scholarship opportunities for students pursuing careers in the industries they serve. Students interested in pursuing cosmetology as a career will want to look into the financial aid programs supported and promoted by professional associations that advocate for the beauty industry. The following selection of scholarships are supported in whole, or in part, by professional associations connected with the cosmetology industry. The Beauty Changes Lives Scholarship is sponsored in collaboration with the American Association of Cosmetology Schools. $2000 scholarships are available to students enrolled in esthetics, nails, barbering or massage at a participating school of cosmetology. The NCEA Esthetician Scholarship is supported by the National Coalition of Estheticians, Manufacturers/Distributors and Associations. The $1000 scholarship is offered to students who can demonstrate the required level of academic achievement and financial need. Interested students must submit a 250 word essay with their application. The Fred Luster Sr. Education Foundation Scholarship is sponsored by the American Health and Beauty Aids Institute. The foundation offers 12 annual $250 scholarships for students pursuing cosmetology training. To be eligible, students must have an 85% or higher average in school, and must have a minimum of 300 hours of cosmetology training. The Professional Beauty Association/National Cosmetology Association sponsors a variety of scholarships for cosmetology students, including the Minerva Beauty Scholarship and the Smooth and Shine Cosmetology Scholarship. To be eligible students must be enrolled in an accredited cosmetology program, must have a minimum 3.0 GPA, and must present a letter of recommendation from an industry professional. Fifteen $1000 scholarships are awarded annually. Community colleges, vocational schools and cosmetology schools often sponsor, or administer scholarship programs for deserving students. Some of these programs are supported directly by the school, while others are supported by state funds and private endowments. Students interested in pursuing a career in cosmetology should contact their school’s office of financial aid for information on scholarship programs which may be available to them. The Virginia Ames Cosmetology Scholarship is available to students attending Highland Community College in Northwestern Illinois. To be eligible, applicants must be full time students in the HCC Cosmetology program. Award amounts vary, and are determined by academic achievement and financial need. The Robert and Irene Kimber Cosmetology Scholarship is available to students enrolled in the cosmetology program at Idaho State University. To be eligible students must have a minimum 2.0 GPA, and must demonstrate the requisite level of financial need. Award amounts vary. Aveda Institutes own and operate beauty schools in nearly every state in the country. One of North America’s most respected Cosmetology Schools, Aveda Institutes offer a wide range of financial aid programs, including scholarships, for their enrolled students. Each school supports its own selection of programs, and students are encouraged to contact their closest Aveda Institute for information on scholarship programs currently being sponsored. Austin’s School of Spa Technology in Albany, New York offers a number of financial aid programs, including the Austin’s School of Spa Technology Alumni Scholarship. The program awards ten $300 scholarships per year. To be eligible students must be nominated by an alumni of the school. The sampling of scholarship opportunities discussed here are just the beginning of the financial aid opportunities open to students pursuing a professional career in the beauty industry. A career in cosmetology offers a bright and exciting future. 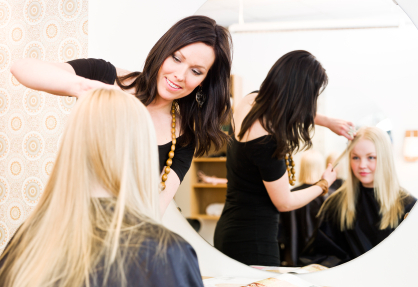 Licensed cosmetologists often start their own small businesses, opening spas and salons as their careers advance. Some ultimately find themselves working in the television and film industry. If the abundance of scholarships is any indication, lucrative careers in cosmetology are here to stay.